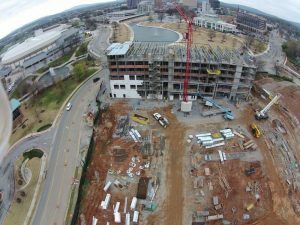 A $100 million, mixed-use development in Huntsville, Ala., is becoming a reality. The project, known as CityCentre at Big Spring, will include 30,000 sq. ft. of retail and restaurant space, surrounded by upscale apartment homes and a 125-key AC Hotel. The six-level AC Hotel will serve the magnitude of tourists that want to stay in an international acclaimed hotel brand. The building will have an exterior of brick, glass, stucco and metal panels. The first two levels of the structure will be cast-in-place, post-tensioned concrete flat slabs, with the top four guest room levels a cold-formed steel, load-bearing wall system. A combination of VRF and split DX mechanical systems will be installed. The wall system will include prefabricated 14-gauge framing members. Epicore decking will be placed over the bearing walls and a five-inch concrete deck will be placed over it.